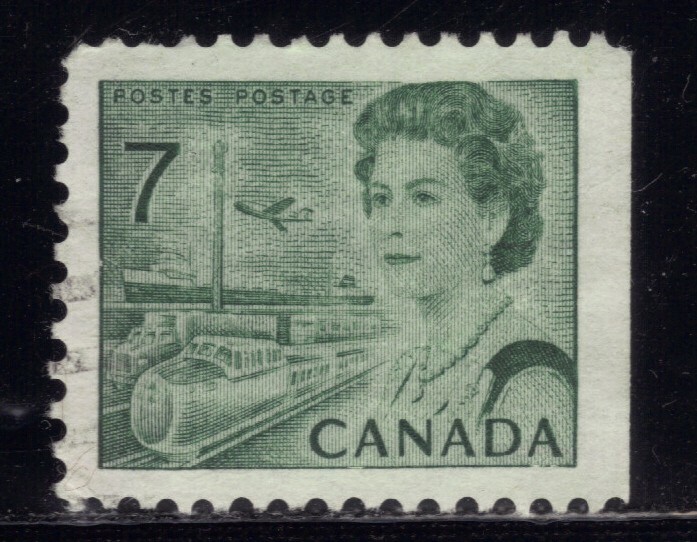 Historical Notice: Canada's new 7c. 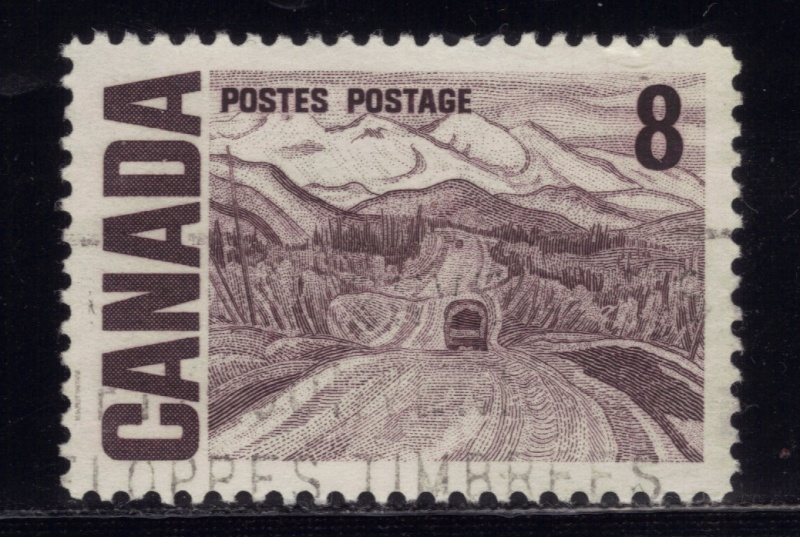 definitve postage stamp, based on a "Communications and Transportation" design originally employed on 1st November 1968, will extend a series which dates back to 8th February 1967. 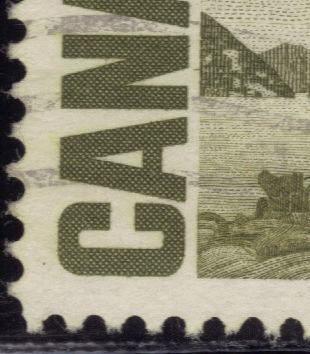 A tone of green utilized on the new stamp has given evidence of a quality in colour which is effective in a system of mechanical facer-cancelling equipment. 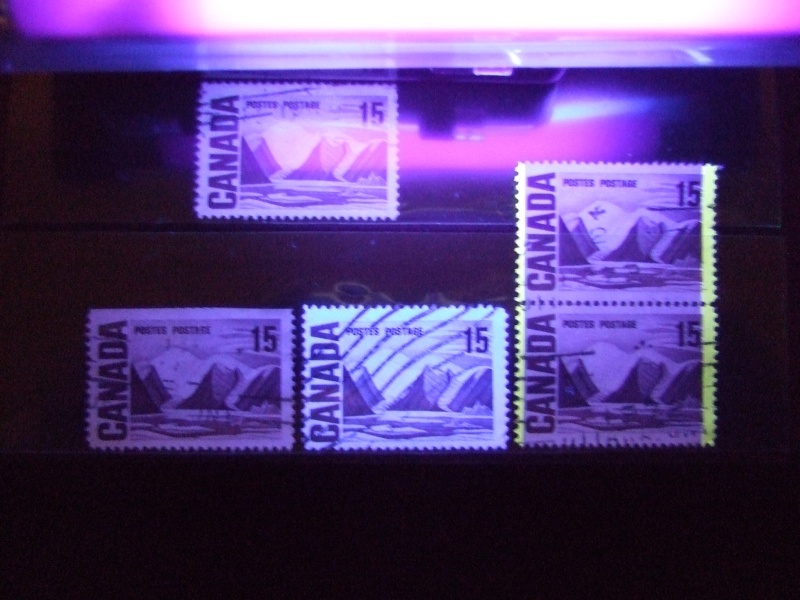 The stamp design, in a format similar to other values illustrating the five major economic regions of Canada, pays tribute to the importance of transportation and communications as vital services linking vast reaches of our country. The microwave tower, part of a coast-to-coast system supplementing land-line and cable connections, is symbolic of communications. Transportation is illustrated by a variety of land, air and water vehicles. Extraordinary transportation statistics become commonplace in a land approximately 5,000 miles by 3,000 miles. Canada's vital transport needs in the commercial development of a near 22 million population are served by an estimated 60,000 miles of railway tracks, more milage per capita than any other country in the world. Nearly 500,000 miles of highways and streets, mostly surfaced, are available for some 8,500,000 registered motor vehicles. "Main Street" in Canada, a dream for decades, became a reality in 1962 with the completion of the Trans-Canada Highway. This vast one billion dollar project, coordinated by an Act of Parliament passed in 1949, stretches more than 4,800 miles from St. John's, in the island Province of Newfoundland, to Victoria, on British Columbia's Vancouver Island. Herculean engineering feats in the construction of Canada's "Main Street" recall epic achievements in the 1880's when the nation's Pacific coast province, British Columbia, was first linked with the eastern provinces by a transcontinental rail line. Approximately 65 miles of railway track were in existence in all British North American Colonies in the year 1850; by 1860 the ribbons of steel exceeded 2,000 miles. Since alexander Graham Bell's "Silver Dart" achieved Canada's first airplane flight in 1909, conquest of the air has made vast contribution to the nation's economy and to communications with remote areas. Powerful jets today speed passengers and goods from ocean to ocean in the matter of a few hours. By contrast, on 1920, the first coast to coast flight, organized by the Canadian Air Board, required a flying time of 45 hours from October 7th to October 17th. Waterways had been the first highways and a development of these natural routes was synonymous with the spread of commerce. Nature's barriers in the form of waterfalls and rapids have been overcome by vast engineering works, the most notable being the St. Lawrence Deep Waterway's project. 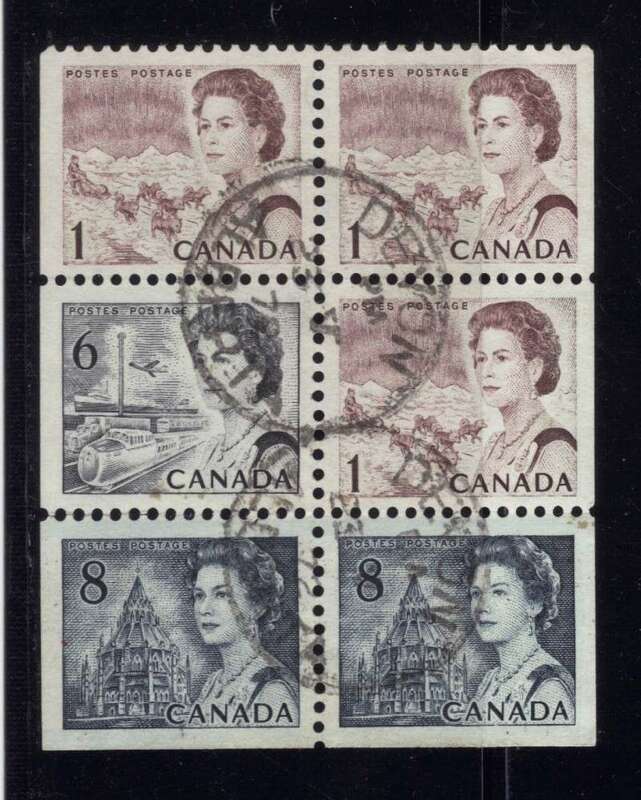 Completed in 1959 at a total cost of $470,000,000, Canada's share of which was $330,000,000, the Seaway transformed inland lake cities into seaports and enables all but the largest seagoing vessels to steam 2,000 miles inland. 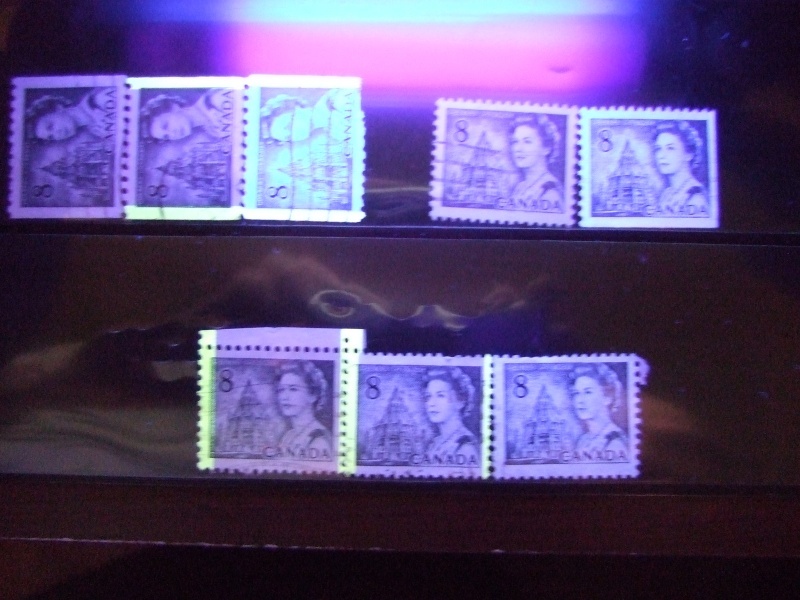 Next is a slight color variant ; both stamps are from the British American bank note company, the first is a darker shade form a sheet perf 12.5 X 12 with dull fluorescence and Dex gum, the next is a dull green from a sheet also with perf 12.5 X 12 and dull fluorescence and Dextrine gum. 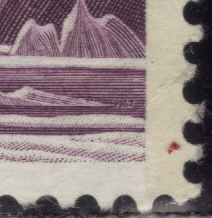 There are several Errors on this stamp as well as color variants. Next is the Coil scott number 549, Hi-Brite paper with dextrine gum . Next is a scan under the black light showing different types of paper and fluorescence speckling. the Coil is first with a Hi Brite paper , and perf 10 Horizontally. next is the booklet in dull fluorescence and perf of 12.5 X 12 ,next is a sheet stamp perf 12.5 X 12 with low fluorescence speckling when only some of the fluorescence shows. The year 1972 was proclaimed International Book year by the United Nations Ecomomic, Social and Cultural Organization (UNESCO) at the 16th session of its General Conference. In issuing this new 8c. 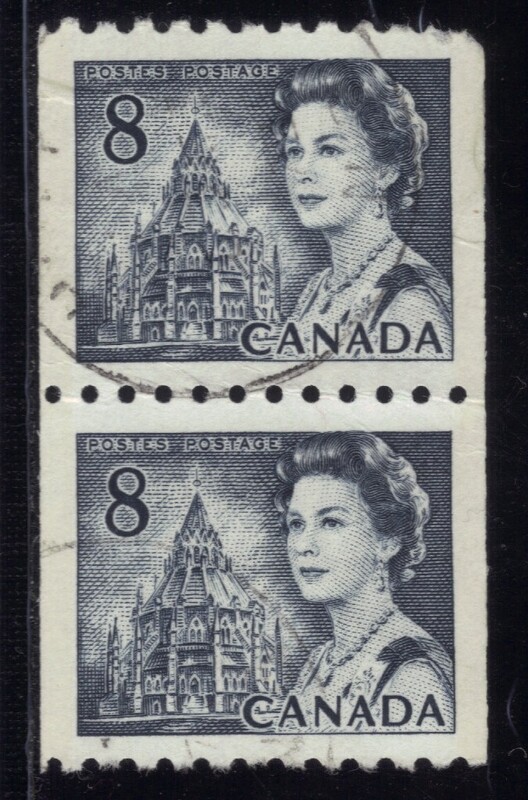 definitive stamp, the design of which includes the Library of Parliament, Canada is paying tribute to International Book Year and recognizing the importance of the role books play in society. The UNESCO resolution that established International Book Year pointed out the importance of the written word for the progress of human civilization. Books and periodicals make an essential contribution to social life and its development and in addition have a fundamental role in the realization of UNESCO's objectives - peace, development, the promotion of human rights and the campaign against racialism and colonialism. The resolution also invited member states to initiate programmes to encourage the writing, production and distribution of books, to carry out activities which will stimulate the habit of reading, and to celebrate International Book Year at a national level. 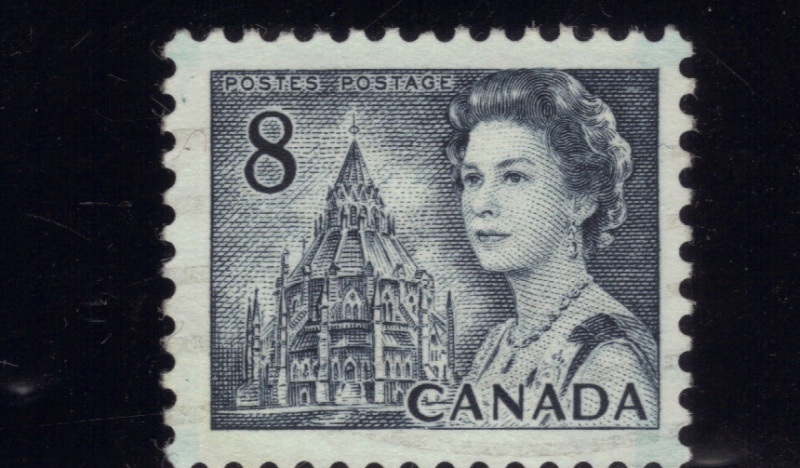 The Library of Parliament is an appropriate national symbol of Canada's participation. The Library of Parliament was established in 1871 by An Act in relation to the Library of Parliament. It was formed initially by the amalgamation of the legislative libraries of Upper and Lower Canada after the two provinces united to become the Province of Canada in 1841. The Library is a separate building to the rear of the Centre Block of the Parliament Buildings. Construction of the original building was completed in 1876. When the Centre Block was destroyed by fire on February 3, 1916, heavy iron doors in the corridor connecting the two buildings saved the Library. In 1952, however, the Library was the victim of the same enemy, and much of it had to be rebuilt. The original interior woodwork was carefully preserved, but fireproof and fire-resistant materials were used as much as possible in the reconstruction. The Library was reopened in 1956. The Speaker of the Senate and the Speaker of the House of Commons are responsible for the direction and control of the Library. They are assisted by a joint committee appointed by the two Houses at each session. The day-to-day operations of the Library are in the hands of the Parliamentary Librarian. The Library supplies the Senate and the House of Commons with both reference and research material. It currently houses some 300,000 volumes and receives all 103 Canadian daily newspapers, almost all the Canadian weeklies, 1,800 periodicals and all federal and provincial publications, as well as the publications of international organizations such as the United Nations. The Reference Branch answers inquiries, selects and provides source material for use in speeches and papers, prepares bibliographies, indexes and abstracts, and lends library material. Because of the quality and size of the collection, this branch also provides substantial assistance to Royal Commissions, government departments, the academic community and other non-parliamentary groups and individuals. The Research Branch was established in 1965. It complements the Reference Branch, but serves only Senators and Members of Parliament. Its lawyers, economists and other professional personnel prepare research papers and notes at the request of Senators, Members of Parliament, Parliamentary Committees and Parliamentary Associations. The Library of Parliament is the public's main information centre for parliamentary information. If International book Year is successful in stimulating the interest of Canadians in reading, especially reading Canadiana, it could well give an important boost to our publishing industry. 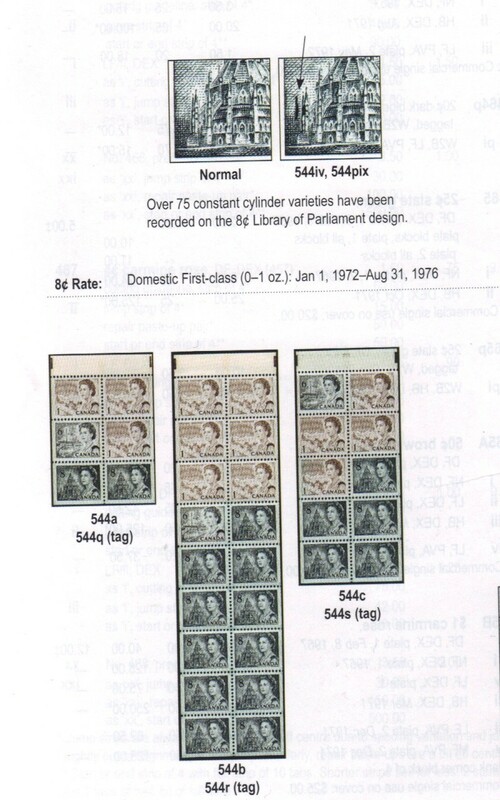 Next is 2 8 cent stamps with very slight colour variant, the first is a booklet ,perf 12.5 X 12 and from the British American bank note company,with Hi-Brite paper and pva gum, unitrade number 544aiv, next is a sheet stamp perf 12.5 X 12 and Dull fluorescence and dex gum. Next is the Coil pair , perf 10 horizontal, medium fluorescence and PVA gum scott number 550. 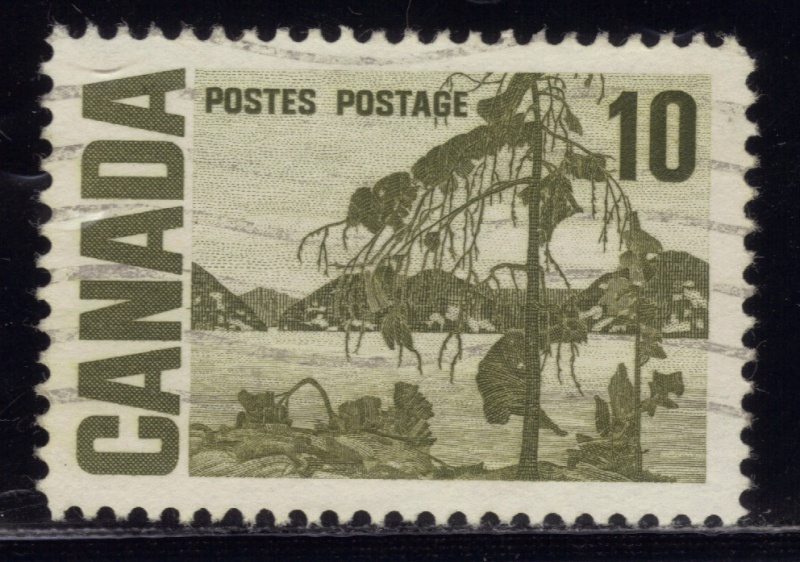 Next is a scan of one of the hundreds of varieties of this stamp. plus the booklet types . the variety shown is the extra spire. 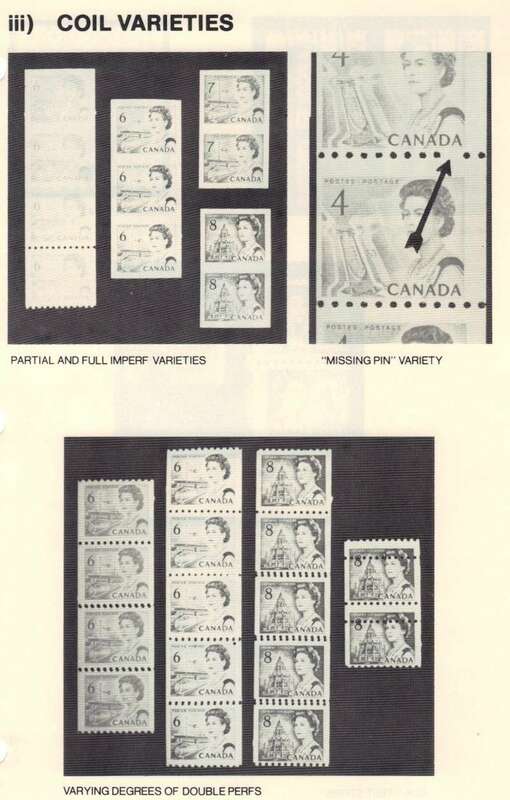 Next is a scan of more varieties , on the six cent and eight cent and 15 cent. below is the many coil errors. 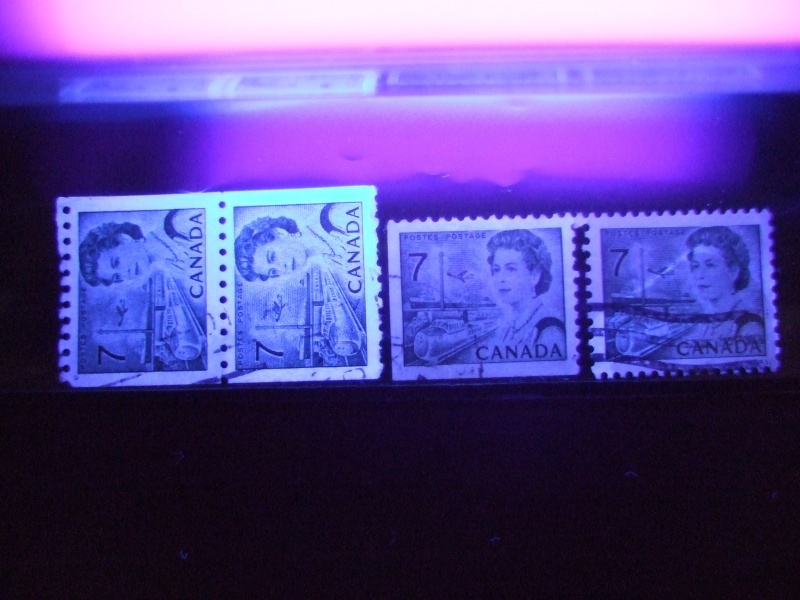 Next is a scan under a black light of the 8 cent stamp Varieties: top 3 are Coils showing the first with non fluorescence , the next with OP2 tagging on low fluorescence, and the last coil with high fluorescence and OP4 tagging which tends to turn whit from washing off paper. 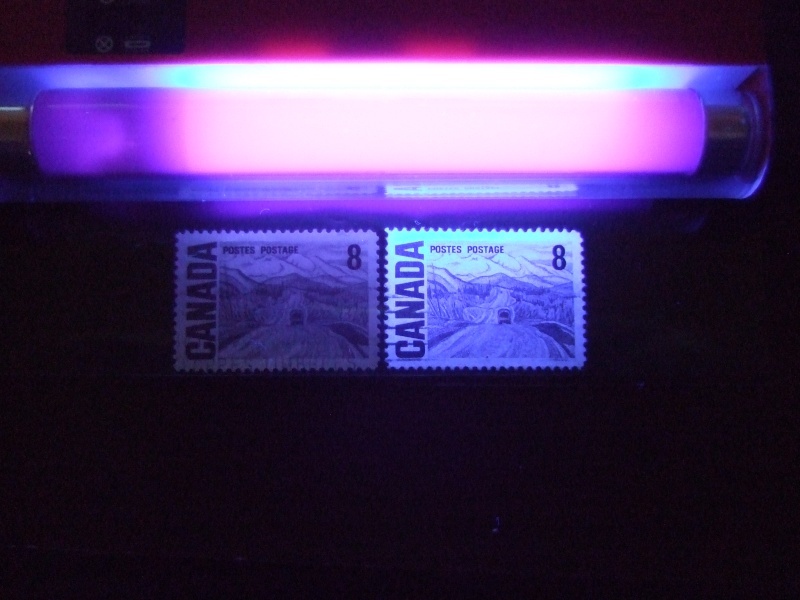 the next set are : first the sheet stamp with non fluorescence , the second is a booklet with High fluorescence . the next is 3 stamps sheet variety ,first is non fluorescence and OP2 tagging, the second is medium fluorescence with OP2 tagging, the last is high fluorescence with no tagging. 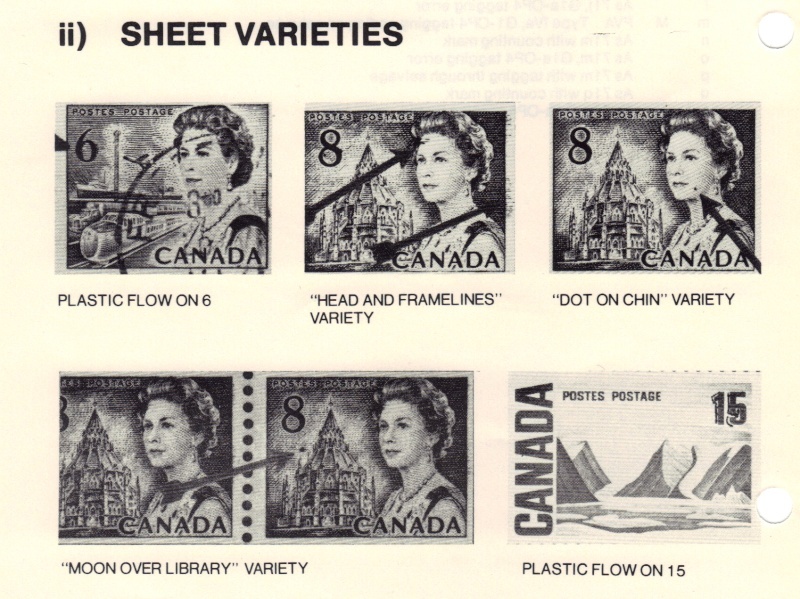 next is some used booklet stamps. Design for the 8¢ issue is a central portion of a painting done by A.Y. Jackson titled "Alaska Highway between Watson Lake and Nelson". 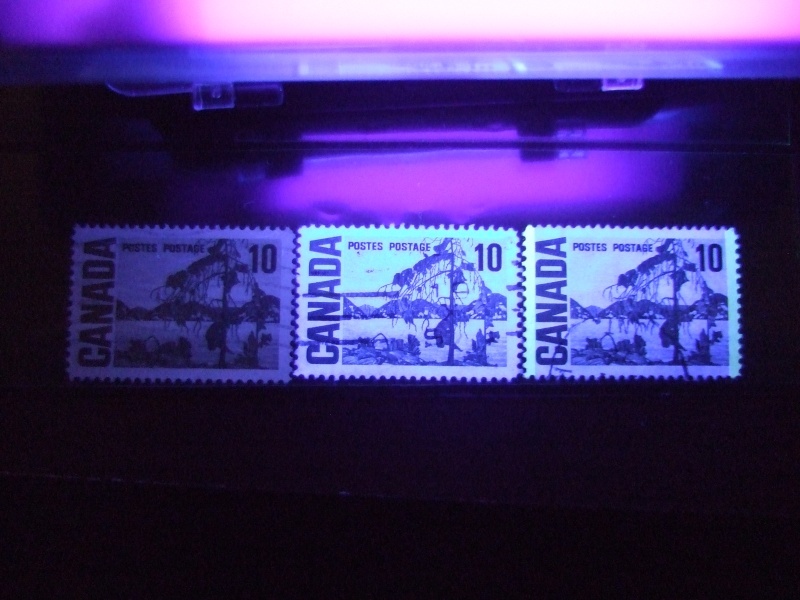 Next is a scan under a black light of the 2 eight cent stamps showing the dull fluorescence and Hi-Brite papers, ,perf 12 and dex gum from the Canadian bank note company. 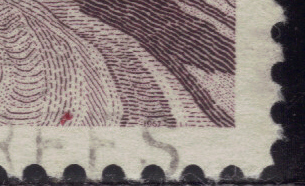 There is a plastic flow Error on this stamp on the 8 ,but i dont have one yet . There is a hidden date on this stamp. bottom right corner . 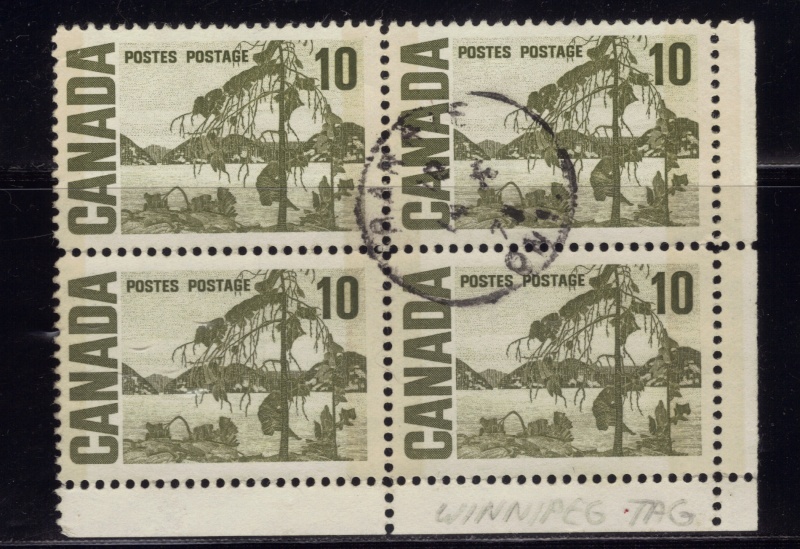 Design for the 10¢ issue is a central portion of a work done by Tom Thomson, titled "The Jack Pine". ext is a block of 4 10 cent Winnipeg 2 bar tagging, with non fluorescence unitrade number 462i. Next is a scan under the black light showing tagging and Hi-Brite and fluorescence paper, aslo showing OP2 tagging. There is a hidden date on this stamp. midway on bottom left .see scan. 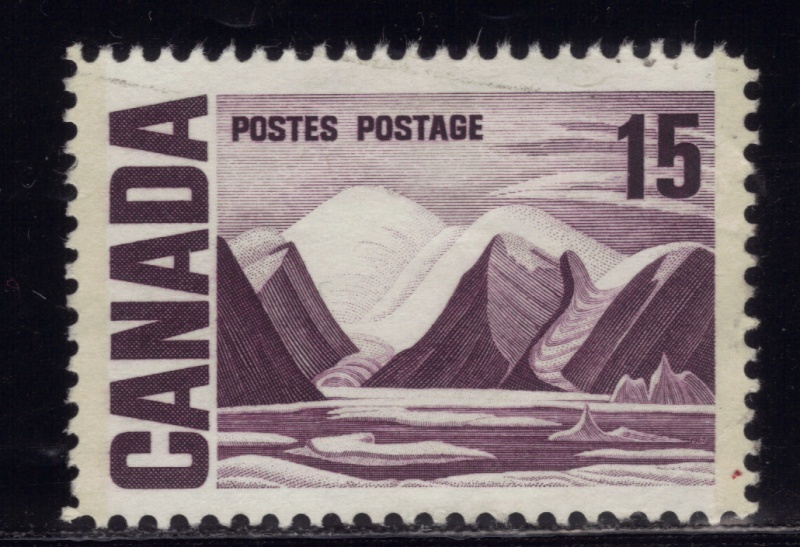 Design for the 15¢ issue is a central portion of a work done by Lawren Harris titled "Greenland Mountains". 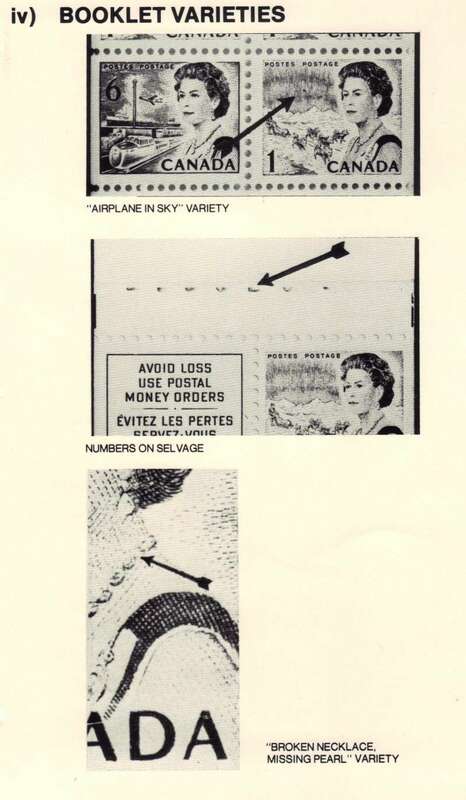 Next is a scan of the 15 cent stamps showing tagging and Hi-Brite , and fluorescence , perf 12 . I noticed a hidden date on the 15 cent. 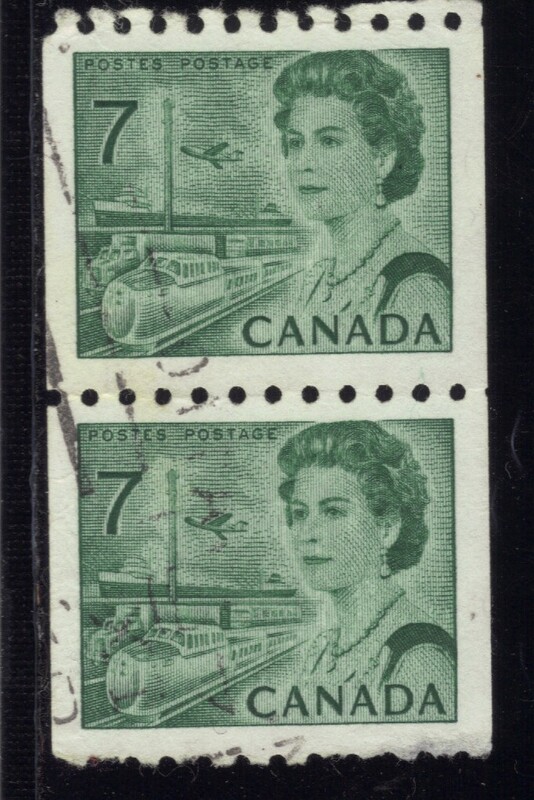 heres a scan of the bottom right corner with the date 1967.